It’s really the combination of it all—the wind rushing at your face, the deep breaths of outside air, the sun heating your back, blurs of green passing by your eyes as you head down the road. Sure, you ride for the exercise, but that’s an added bonus of why you really ride: to get outside and reconnect with all that is real. When the phone is buzzing, the television is ranting, the emails keep coming … that’s when you know it’s time to leave it all behind and become grounded again. Return to the natural. The Nature Collection reminds us of why we get on the bike day after day. Why we live for the quiet click of the wheel turning in an otherwise silent morning. Why temperatures in the 90s and afternoon downpours aren’t always a bad thing; instead, they’re a reminder of the real and present. The Earth cycling kit is a tribute to the intrinsic processes of nature, and a reminder of the role we play in these cycles. 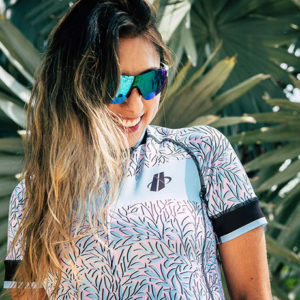 The Bloom cycling kit is a symbol of strength, beauty, and life. The Fire cycling kit reminds us of this fleeting time of day and encourages an appreciation for the transient nature of life.